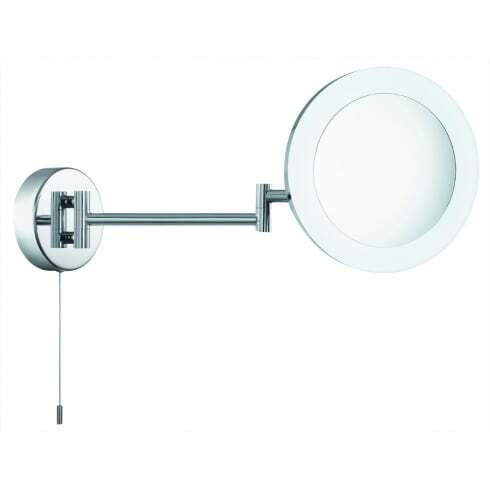 Searchlight Lighting illuminated bathroom wall mirror features a circular design wall plate with extending swing arm in polished chrome finish and magnifying mirror with frosted outer ring. The product code for this Searchlight mirror light is 1456CC. This incredibly modern and stylish mirror is ideal for shaving, applying make-up, or simply doing your hair. With a built-in light and fully adjustable head, it's perfect for taking a closer look, so you and your bathroom will look perfect. IP44 rated makes this suitable for bathroom use and operated by a pull cord switch. A wide range of magnifying bathroom mirrors can be viewed on our website.